Check out Skycircus, the follow up to both Cogheart and Moonlocket! That’s the premise of Skycircus, a brand new book by Peter Bunzl! It follows on from both Cogheart and Moonlocket. But behind the daredevil deeds of the bewitching bird-girl and the lobster-handed boy, something sinister lurks. And soon, the watchful ringmistress, Madame Lyons-Mane, reveals a deadly plan for Lily. Could the secrets of Lily’s past hold their only chance of escape from this terrible trap? 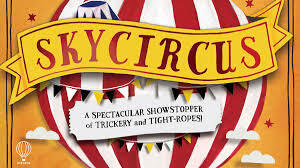 Roll up roll up, for a spectacular showstopper of trickery and tight-ropes!